Special Operations Medical Association (SOMA) 2019 Scientific Assembly is organized by Special Operations Medical Association (SOMA) and will be held from May 06 - 10, 2019 at Charlotte Convention Center, Charlotte, North Carolina, United States of America. Additional details will be posted as soon as they are available. 2019 Resident Advanced Trauma Techniques Course is organized by Orthopaedic Trauma Association (OTA) and will be held from May 10 - 11, 2019 at The Westin Charlotte, Charlotte, North Carolina, United States of America. The target audience for this medical event is PGY4 - PGY5’s, but others who have completed the OTA Residents Comprehensive Fracture Course or equivalent and feel they will benefit are not excluded. Course Description : The Resident Advanced Trauma Techniques Course will be presented in six (6) separate small group modules, with twenty residents and three (3) experienced faculty educators per module. The modules will have a rapid-fire series of mini-lectures, an extensive open case-based discussion, video demonstrations of techniques, and hands-on skills lab exercises. Modules will cover advanced trauma techniques among six topics: • Diaphyseal • Foot & Ankle • Knee • Pelvis/Acetabulum/Hip • Upper Extremity • Complications/Challenges Additional details will be posted as soon as they are available. Pediatric Orthopaedic Society of North America (POSNA) Annual Meeting is organized by Pediatric Orthopaedic Society of North America (POSNA) and will be held from May 15 - 18, 2019 at Charlotte Convention Center, Charlotte, North Carolina, United States Of America. Additional details will be posted as soon as they are available. 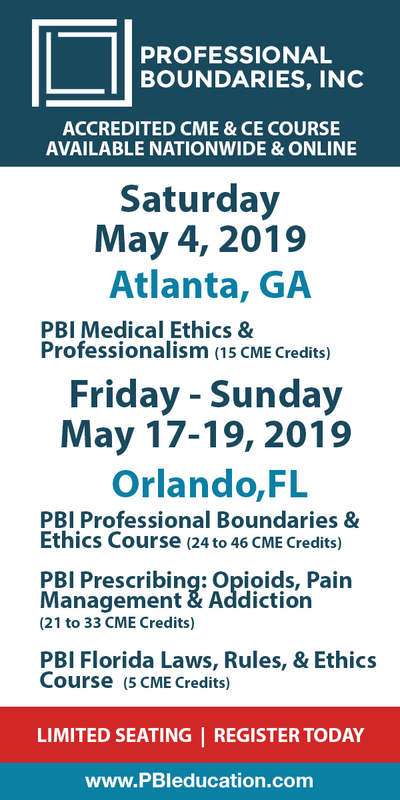 Internal Family Systems Therapy: Step-by-Step Procedures for Healing Traumatic Wounds and Alleviating Anxiety, Depression, Trauma, Addiction and More is organized by PESI HealthCare and will be held on May 17, 2019 at Hilton Garden Inn Charlotte/Ayrsley, Charlotte, North Carolina, United States of America. This CME Conference has been approved for a maximum of 6.25 clock hours of continuing education. Target Audience: • Counselors • Social Workers • Psychologists • Addiction Counselors • Marriage and Family Therapists • Therapists • Other Professionals Who Work within the Mental Health Fields Course Description: After decades of clinical innovation and recent scientific research, the empirically validated Internal Family Systems (IFS) model has been shown to be effective at improving clients’ general functioning and well-being. This effective model provides clinicians with procedures for helping clients with the most challenging mental health profiles to heal the wounded, burdened, and traumatized parts of their systems. The IFS model provides a compassionate, respectful, non-pathologizing approach to understanding the organization and functioning of the human psyche. The transformative IFS approach embraces and celebrates the natural multiplicity of the mind. Its assumption that every part of the system has good intention and valuable resources allows clinicians to approach even the most troubling of “symptoms” with compassion and respect. IFS offers therapists a powerful and effective set of tools for empowering clients with a wide range of clinical profiles to heal the wounded and burdened parts of their internal systems, resulting in: • a way to enter clients’ inner ecology without the overemphasis on containment and stabilization • symptom reduction and improved functioning for clients • deep self-healing within even the most troubled clients IFS is a powerful treatment modality. Once you experience it, you will want to incorporate it into your practice. Through instruction, video demonstration, and experiential exercises, Alexia D. Rothman, Ph.D., Certified IFS therapist and college of Dr. Richard Schwartz (founder of IFS) will show you step-by-step how to apply the most effective, empirically validated IFS interventions to help your clients connect with and understand their conflicting parts to facilitate deep, lasting healing. Course Objectives: • Present the origins and development of the Internal Family Systems Model, including empirical support for the model and the current status of research using IFS to treat posttraumatic stress disorder. • Provide an in-depth overview of IFS theory, basic principles, assumptions of the model and its treatment implications. • Describe the three major components of the psyche as outlined by IFS (parts, burdens, and the Self) including the characteristics of and assumptions regarding each component as they relate to clinical practice. • Discuss the goals of IFS therapy and case conceptualization through an IFS lens. • Provide a grounding in IFS procedures and techniques that can be implemented immediately in clinical and personal work, including the steps for facilitating the development of Self-Part relationships. • Summarize the steps of healing and unburdening wounded parts of the system in session. 2019 International Society of Psychiatric-Mental Health Nurses (ISPN) Annual Conference is organized by International Society of Psychiatric-Mental Health Nurses (ISPN) and will be held from May 29 - Jun 01, 2019 at Charlotte Marriott City Center, Charlotte, North Carolina, United States of America. Conference Objectives: At the end of this conference, the participant should be able to: • Evaluate the academic and continuing education issues that continue to emerge in the 21st century. • Examine mental health care issues through scholarly inquiry. • Synthesize new trends in Evidence-Based Practice to enhance mental health care delivery. • Identify innovative leadership strategies to advance the profession. • Identify the role of advanced practice nursing in providing psychopharmacological care. • Examine a psychopharmacological issue related to a specific population. Additional details will be posted as soon as they are available. Psychopharmacology in Plain English: Essential Information for Mental Health Professionals is organized by PESI HealthCare and will be held on Jun 06, 2019 at Hilton Garden Inn Charlotte/Ayrsley, Charlotte, North Carolina, United States of America. Additional details will be posted as soon as they are available. 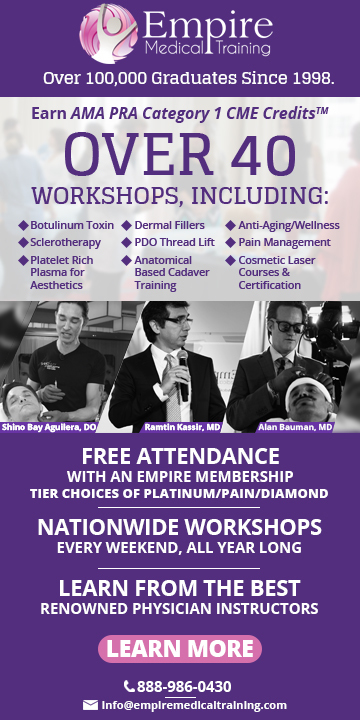 Platelet Rich Plasma for Aesthetics is organized by Empire Medical Training (EMT), Inc and will be held on Jun 21, 2019 at Hyatt House Charlotte/Center City, Charlotte, North Carolina, United States of America. This CME Conference has been approved for a maximum of 6.5 AMA PRA Category 1 Credits. Overview: The popularity of Platelet Rich Plasma (PRP) treatments among patients for aesthetic purposes has exploded in recent years as patients are now realizing the long-term and permanent benefits of this procedure. With the average treatment cost of $600 - $1,800 per patient depending upon indications aesthetically or medically, it allows for the physician to realize additional cash revenues within their practice with little or no capital expenditure. Empire Medical's Platelet Rich Plasma (PRP) Training is the perfect complement to other aesthetic injectible procedures (i.e. Botox/Dermal Fillers) and can be easily incorporated into any type of medical or aesthetic practice. PRP therapies allow for the separation of a patient’s blood through a variety of harvesting techniques to extract a concentration of autologous platelets (2.5x – 9.0x). These platelets when activated release adhesive glycoproteins (fibrin, fibronectin, and vitronectin) and various growth factors forming a fibrin mesh under the tissue. Target Audience This activity designed to meet the educational needs of physicians, physician assistants, nurses and other healthcare professionals interested in effective weight loss treatments for patients. Program Overview The Platelet Rich Plasma course will review all of the indications for the use of PRP for all aesthetic, medical, pain management, and alopecia indications. This evidence-based course allows you to understand and fully integrate this popular procedure within your practice. Learning Objectives Upon completion of the educational activity, participants should be able to: • Identify appropriate candidates for Platelet Rich Plasma (PRP) injections based on medical and/or aesthetic need determined by evidence-based protocols to optimize outcomes. • Describe the various standards of care to safely administer secondary uses of Autologous PRP injections for medical pain management. • Apply proper injection technique of PRP to safely administer the product, minimize complications and provide optimal patient outcomes. Additional details will be posted as soon as they are available. Environmental Carcinogenesis: Potential Pathway to Cancer Prevention is organized by American Association for Cancer Research (AACR) and will be held during Jun 22 - 24, 2019 at The Westin Charlotte, Charlotte, North Carolina, United States of America. The main purpose of this conference is to raise the visibility of advances in the field of environmental carcinogenesis in order to stimulate thinking about new approaches to cancer prevention. This will be achieved by critically reviewing the evidence of the role of environmental chemicals in the cause and progression of cancer, highlighting new conceptual and technological advances in the field, and outlining the steps required to implement preventive measures. Additional details will be posted as soon as they are available. Botulinum Toxin Training is organized by Empire Medical Training (EMT), Inc and will be held on Jun 22, 2019 at Hyatt House Charlotte/Center City, Charlotte, North Carolina, United States of America. This Course has been approved for a maximum of 8.0 AMA PRA Category 1 Credit(s)™. Description: The Botox Training course is intended for Physicians, Nurses, Dentists, and other Licensed Healthcare Professionals who are eager to learn a specific skill set associated with mastering the injectable procedures. Our Botox Training workshops, and other aesthetic procedure training classes, are offered throughout the year at major destination venues just about every weekend. For your convenience, we have scheduled our most popular aesthetic training courses over a weekend so you can easily attend the complete set of programs. Our Botox Training courses are considered to be the most comprehensive with hands on training as an integral part of the program and testing to ensure each attendee has satisfied the requirements for certification. For medical professionals interesting in developing or expanding their Aesthetics practice, Empire’s Complete Botox course is the best place to begin. These complete courses in Botox Training, Dermal Filler Training and Facial Aesthetics Workshops are the very basis for every Aesthetics’ practice. Educational Objectives • Practice procedures such as aesthetic botulinum injections competently, safely, and effectively for their patient. Each participant will understand and learn how to avoid risks and associated complications. • Apply the generally accepted protocols for the administration of the botulin toxin for various aesthetic and medical conditions (i.e. orofacial pain). Learn the proper guidelines for the acquisition, patient charting, administration issues (i.e. medical intake forms, informed consents) and the corrective measures for adverse events. • Describe the mechanism of action and basic facial anatomy, differences between the product characteristics, patient preferences, managing expectations, and after care for follow up after the botulinum toxin procedure. • Identify who is a candidate for the botulinum toxin procedure, patient benefits, and long-term use of the prescription. Increase patient awareness and offer enhanced patient care in relation to the botulinum toxin procedure. Additional details will be posted as soon as they are available.